Uncle Rafe, do you remember how last time you were here you wrestled with me? Can we…can we do that again? I always say yes, and pretty soon a couple hours have gone by in playful roughhousing, leaving both of us sweating and smiling. Usually, a few other kids in the family join in as well. He has punched me and kicked me and tackled me (I helpfully fall down). He has climbed on my shoulders and jumped off, shown me how he can do somersaults and cartwheels. I have pushed him, tackled him, gently punched him, dive-rolled and cartwheeled over him, hit him with pillows, picked him up and spun and flipped him in more ways than I can count. Earlier this year, I was told he had been diagnosed with ADHD and put on Ritalin. He was five at the time. The idea that it is so vastly important for kids in kindergarten to be properly attentive is deeply problematic in its own right, but even if there was a need to achieve some change in his behavior right away, I don’t think Ritalin was the right prescription. I think wrestling is, and running, and jumping and climbing, and maybe being given space and support in acting like a child! My nephew is inherently driven to be a highly physical person. Drugging him to deaden that drive is not, in my opinion, a solution. It is a denial of his basic nature. Marco may be an outlier in his need for movement, but he reflects a systemic problem: it may be less expressed in other children but the loss of time for play and freedom in play harms all kids, and adults too. We have somehow gotten to the point where more and more kids need to be drugged just to fit into our expectations of how a child should be; we have pathologized childhood and masculinity, giving little boys a double handicap. Recognizing the value of rough and tumble play is huge part of recovering a healthy childhood, building a culture of movers, and reclaiming the value of masculinity. I was once a boy like my nephew Marco, struggling in school, diagnosed with ADHD and dyslexia, and testing as functionally illiterate after third grade. I had the incredible luck to have a mentor who took me in and took over my education. Part of what he did was provide an outlet for my drive to play. We spent hours wrestling. I hit him and choked him and tackled him and he swung, carried, and threw me. I eventually trusted him enough to actually try learning, and by the end of one year of working with him I went from unwilling to try to read, to reading the Lord of the Rings. I have never completely escaped the symptoms of ADHD and dyslexia, but I managed to score well on my college entrance exams and to earn a 3.2 GPA at university before I quit to pursue movement coaching. 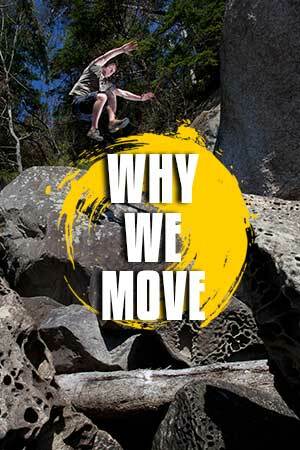 Throughout my life I have found that the only medicine that truly helped me was movement, from roughhousing as a kid, to martial arts and gymnastics in my teens, and now parkour since I was 23. Even today, if I have to step back from my movement practice for too long, I can feel the lack of focus developing and I know I will soon be misplacing my keys and wallet. For me movement isn’t a hobby, it is medicine and in truth the essence and the purpose of my life. I know I am not alone. We are made to move. For those who don’t share my learning disabilities or my naturally aggressive temperament, perhaps the drive is less strong or easier to ignore, but it is still there. My daughter Audrey is 15 months old. The moment she wakes up she is moving, exploring, fascinated by her ability to move herself, to crawl under and over, to climb up and down, to toddle here and there. She laughs breathlessly after she completes an unstable run from one couch to another. She loves to climb up and push me over and pull me back up. She loves to be lifted, spun, and thrown. Before she has language to describe it, Audrey knows on the deepest level that she has to move and play. She moves because it is fun, because it is joyous, and through that movement she develops the capacities she needs to be a functional human being. Few would think it a good idea to deny her the opportunity to play and develop the capacities her innate drives tell her are important at 15 months, but somehow by 5 years old we have lost sight of this. Our motor development doesn’t stop after pre-school, so why are we drugging children who are driven to move, why are we shutting down and denying natural play? We do this because of fear: fear that without these draconian measures our children will fall behind scholastically, fear that without them they will become violent. Nothing could be further from the truth. Play is the work of the child, evolution’s solution for building strong, capable human beings. To constrain it is to deny an essential part of our humanity. Why is Roughhousing So Vital? The simplest answer is because it is so fun, and the extension is that it is so fun because it is important to the development of the child. Puppies and dogs play by chasing, grabbing with their mouths, tugging objects, and chewing and tearing them apart because wolves hunt by chasing and pulling down prey, and dissecting and eating them. Kittens will stalk, pounce, bite, and claw because that’s the way cats kill their prey. The very fact that roughhousing is so inherently joyous for kids is evidence that it has been an important part of the development of essential human capacities. Some may say that humans used to need to fight and chase but that in today’s world, those skills are no longer necessary. These people might ask, “why should we do something that might encourage what is considered negative behavior in today’s world?” There are many reasons why this perspective is wrong. We have denied and forgotten our natures as movers. We have become so averse to risk, so afraid of violence, that we shorten recesses in order to prevent kids from having conflict. We tear down amazing older playgrounds made from metal and wood to replace them with new playgrounds designed to limit kids’ potential for movement as much as possible. We live in an era where kids get suspended from school for wrestling over a toy, or making gun shapes with their fingers. These fears are misplaced, and indeed contrary to reality; play makes us smarter, movement is vitally important for the health of the mind, and rough play teaches us our limits and the value of nonviolence. Through exploration of those capacities we gain control over them and the understanding of the appropriate place to express them. I know this first-hand because I had a period of acting out and getting in fights that ended when my mentor gave me the space I needed to express that energy and explore those capacities, and when I dedicated myself to martial arts I chose to not fight at all anymore. In combative movement we are forced to deal with the incredible complexity and unpredictability of a moving opponent, to move in every possible plane, to test our balance, to learn to identify our position in space, to develop muscular tension swiftly and intensely and release it just as swiftly. Contact with our opponents lights up motor sensors all over the body, and all of this provides us an unprecedented level of information to the nervous system, developing coordination, rhythm, agility, balance, and accuracy as well strength, power, speed, and stamina. Rough and tumble play allows us to push our limits and expand them. We do get hurt occasionally but the intrinsically rewarding nature of play teaches us to overcome momentary pain to continue playing, teaching us resilience and courage. When you hit somebody in anger it’s easy to ignore their pain. When you hit someone too hard in play you’re tuned into them and their pain is important to you, teaching empathy and self control. Through this type of play we learn to self-handicap and make sure everybody gets a chance to win so the games can continue. This type of play and the practices that derive from it also have cognitive benefits. The mind is bootstrapped on top of a computer built to control the movement of the body. When we improve our ability to move, our mind follows suit and the improvisation, creativity, conflict resolution and problem solving ability developed in roughhousing help us in developing those skills in the rest of our lives as well. Through roughhousing we get to explore our capacity for violence in a safe way, learning to control our strength and to have empathy for others, so it’s no surprise that the literature shows that violent criminal behavior is correlated with a lack of play in childhood. The kid who has been allowed to roughhouse knows what his body is capable of. He has less reason to fear conflict and deeper understanding of just what damage his body might be capable of dishing out. In the long run this discourages actual violence. The adult who continues to make roughhousing part of his or her life will be stronger, more agile, more resilient, more courageous and focused, and better able to deal with conflict. Over time kids who are allowed to play and athletes who train combat intelligently learn to deal with increasingly more complex and potentially dangerous situations while remaining calm and in control. That sounds like a recipe for highly capable, self-actualized people to me. Unfortunately, even in the places where roughhousing should be most encouraged, like in martial arts and combative training, too often the focus is on tradition and discipline instead, or the sport of self-defense, and the pure joy of play is lost with its many potential benefits. 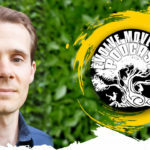 In Evolve Move Play, we build combative skill through progressively scaled games that allow us to gradually increase the amount of force, and the number of variables involved in roughhousing and combative training. 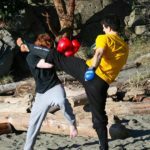 Our focus is not on sport or self-defense–though self-defense is important–but on becoming more capable humans in a general sense through finding ways that allow everyone to experience the challenge and rewards of roughhousing and combative play. While roughhousing is important for everyone, it’s been my experience that boys and men crave it in particular. When my family gets together, the little girls will join in on the roughhousing for awhile, but they always tire of it before the boys, and it is the fathers and uncles who primarily take part in the rough and tumble games with the kids. This has been my experience everywhere I have been. Cross-culturally, men predominantly play the role of warriors and hunters, and the archeological and genetic evidence indicates this has been true for ages. Cross-culturally there are also customs of ritualized play violence for both men and boys; boxing, stick-fighting, and wrestling are virtually universal. By pathologizing roughhousing, however, we are attacking a key component of masculinity, telling the men in our society that their evolved natures are in turn pathological. I believe that advocating for roughhousing, training in combative arts, and being the father, uncle, and cousin who is ready for a bout of wrestling or tag is not just good for our development as adaptable, resilient, happy human beings, but it is also part of reclaiming a positive male role. Of course women should feel encouraged to roughhouse too, and if you’re the father of a daughter don’t neglect to roughhouse with her just because a boy might want to roughhouse a bit more. So find some time in your life and training for a bit of combat. Throw your kids or nephews and nieces or a friend’s kids around. They will love you for it. Practice some basic heckling drills, or some footwork with a friend. Or even go to volunteer at a local animal shelter and wrestle with the dogs; you’ll both be happier for it. Rough and tumble play is an innate evolved drive for human beings, particularly for kids and young men but present in all of us, and exercising it has huge benefits. Trying to prevent it carries huge costs. Let’s recognize this vital part of our humanity for its many benefits and go have some fun.